ARE YOU AN RT46 MANAGED MAINTENANCE MERCHANT? The RT46 2014 Contract was scheduled to come to an end on 31 March 2019, effectively ending the relationship between Transit Solutions (the principal contractor) and Standard Bank Fleet Management, its sub-contractor. However, the State has approved the extension of the RT46 2014 tender by a further 12 months. With effect from 01 April 2019, Standard Bank will be replaced by Absa Vehicle Management Solutions, as the banking partner to Transit Solutions. This will require you to re-apply as an RT46 merchant with Transit Solutions in order to continue participating on the contract. It is in your best interests to submit your application documents as soon as possible but before 15 March 2019. 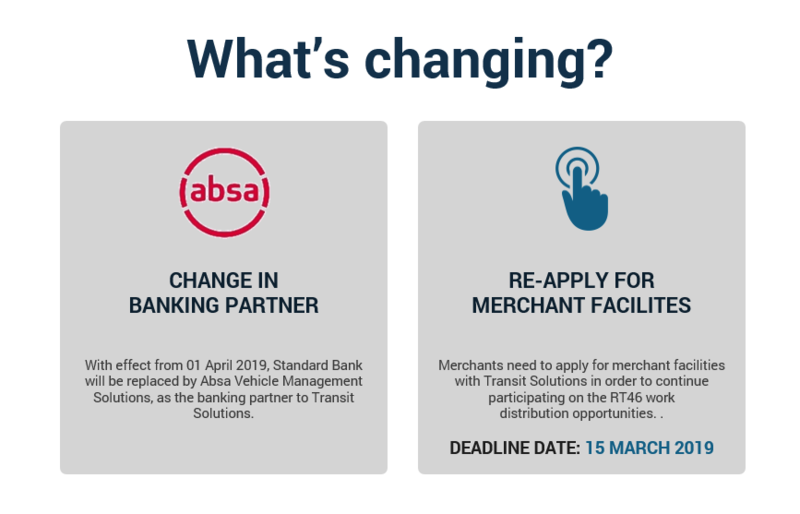 Please note that if you are already an Absa merchant, you will still need to submit an application to participate on RT46.